FORT BENNING, Ga. -- Three Merrill's Marauders, 1944 survivors of the secret mission of almost 3,000 presidential volunteers who fought through the disease-ridden "forgotten theater" of World War II, the China-Burma-India Theater, have lived to the age of 101. Another made it to 100. Living to be a centenarian is remarkable. What is even more remarkable is that those Infantry jungle fighters, who have been called everything from "misfits" to "magnificent," weren't even expected to survive. "We were expendable," said Merrill's Marauder Sam V. Wilson, who turns 93 next month. The retired Army lieutenant general, who helped start Delta Force and still contributes to military publications, explained, "A plan existed on paper to get us into Burma, but no plan existed to get us out." Yet those extraordinary volunteers achieved their final objective on May 17, 1944, of capturing north Burma's only all-weather Myitkyina airstrip by defeating the much larger elite 18th Japanese Imperial Guards Division in five major battles and 30 minor engagements. 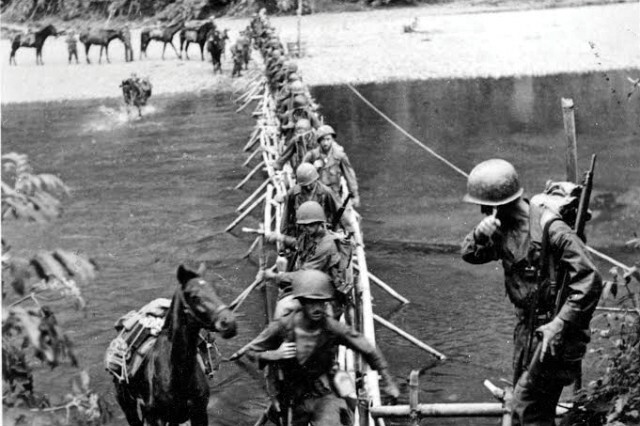 Wilson said that when the remaining elements of the unit were disbanded on Aug. 10, 1944, in Burma, slightly more than 100 of the original Marauders remained. Winston Churchill, British prime minister at the time, described Burma as "the most forbidding fighting country imaginable." Gen. George C. Marshall, then Army chief of staff, said the Burma mission "was one of the most difficult of the war." Marshall also said that mission against "large numbers of the enemy with few resources was unmatched in any theater." "It was hard to keep going as we wore down, became debilitated and our numbers began to decrease," said Wilson recently from his home in Rice, Virginia. "These Soldiers, (who did) not even expected to survive, did survive by forcing themselves to take the next step. They were Infantrymen. They leaned forward and took one more step and then another. Taking that next step is what kept the outfit together to the bitter end." Those steps turned into an almost 1,000-mile, history-making march through the enemy-held Himalayan foothills into the jungles of Burma. 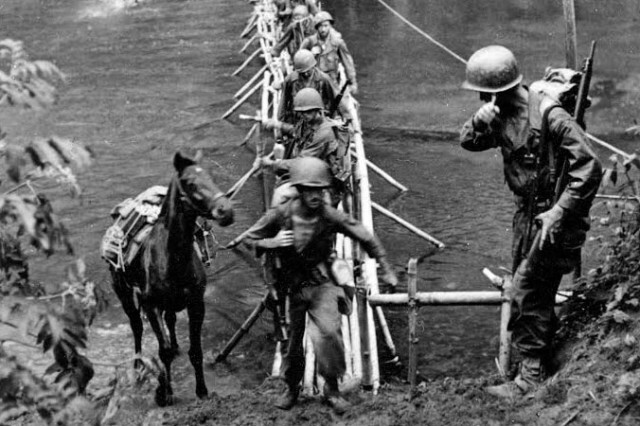 With only what they could carry on their backs or pack on mules, the Marauders walked farther than any other WW II fighting force. They were the first American ground troops to fight the Japanese in Asia. That three elderly Marauders from that "impossible mission" have reached 101 years old and a fourth lived to 100 is a testament to the Army's 1943 stipulation that all the Marauders "will be of a high state of physical ruggedness." It was a Fort Benning "Bayonet and Saber" story a few weeks ago about the funeral of 101-year-old Marauder John M. Jones of Greeneville, Tennessee, that prompted a reader, Brian Yamamoto, to share that another 101-year-old original Marauder, Thomas Tsubota, lives in Hawaii. Tsubota, born in Honolulu in 1915, is now the oldest Merrill's Marauder and is also the only one of the Marauders' Japanese-American interpreters - or Nisei - who is still living. When Japan bombed Pearl Harbor Dec. 7, 1941, Tsubota was on maneuvers with G Company of the Hawaii National Guard's 298th Infantry Regiment. Initially, Tsubota and the other men thought the firing was part of the maneuvers, but quickly learned it wasn't. Tsubota participated in the Dec. 8, 1941, capture of the first prisoner of war, Lt. Kazuo Sakamaki. Later assigned to the 100th Infantry Battalion, Tsubota was selected for the Military Intelligence Service because his background included degrees from Japanese universities, and he had qualified for the 1932 Olympic Trials. In 1943, Tsubota volunteered for a secret "dangerous and hazardous" mission and became one of 14 Nisei interpreters with Merrill's Marauders, nicknamed after their commander, Brig. Gen. Frank D. Merrill. The unit's official designation was the 5307th Composite Unit Provisional. A third 101-year-old Marauder, who was about three months away from his 102nd birthday when he died Aug. 12, 2015, was Everett W. Stanke of Edgerton, Wisconsin. He joined the National Guard in 1931. After transitioning to active duty in 1940, Stanke served with the 128th Infantry Regiment, 2nd Division, in Australia and New Guinea before volunteering for President Franklin D. Roosevelt's 1943 call for a secret "dangerous and hazardous" mission. That those three "expendable" Marauders - Jones, Tsubota and Stanke - survived that 1944 mission, went on to live productive civilian lives, and reached their 101st year is almost miraculous. Merrill's Marauder and Nisei warrior Roy Matsumoto was only weeks away from turning 101 in 2014 when he died on the 70th Easter Sunday anniversary of the 2nd Battalion being rescued by the 1st and 3rd Battalions. They had been surrounded almost two weeks by the Japanese at the battle of Nhpum Ga.
Matsumoto, who played a pivotal role in that rescue, and his 2nd Battalion buddy, Vincent Melillo, had a long phone conversation about the fried chicken and bread airdropped to them following their rescue 70 years earlier at Nhpum Ga. Matsumoto died later that night. Melillo, Georgia's last original Merrill's Marauder, died at age 97 Christmas Eve 2015. China-Burma-India veteran Ernest "Ernie" Hubacker, who turns 101 in October, is quick to point out that he is not a Marauder, even though he faithfully attended their reunions for years. He was part of Mars Task Force, which succeeded the Marauders in Burma. Hubacker still takes part in military activities and went on a WW II Honor Flight to Washington, D.C., this year. A photo of him astride his horse as a young Cavalry solder at Fort Reno, Oklahoma, hangs at Fort Benning's Fiddler's Green Bar. "The Marauders weren't ordinary men," said Wilson. "They were a tough, hard-nosed group of men with a sensitive chip on their shoulders. They had an almost disdain for danger." "Their secret was learning to take the next step," he emphasized. "That's all you have to do, except wipe your hands off from time to time so they won't be too slippery to hold your gun. Today's motivated and well-trained Infantryman knows how to take that next step, which is a universal truth that has a timeless application to the Infantry doughboy. "Knowing we could always take one more step became a mantra - a theme - that has the same application to today's Marauders. The tiny handful of aging Marauders is still making it one step at a time. Some have reached, and others are still reaching, for that magic number of 100 years old." The legacy of this tough group of volunteers is being carried forward by members of the 75th Ranger Regiment, whose crest is the Merrill's Marauder patch, which has never officially been authorized. 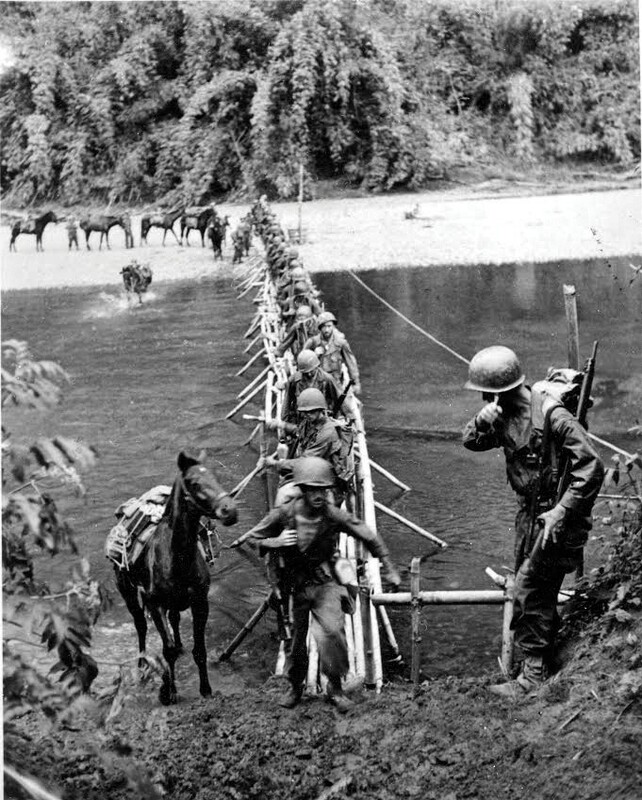 Records indicate that approximately 26 Merrill's Marauders are still living out of almost 3,000 who volunteered in 1943 from the jungles of Panama and Trinidad, Guadalcanal, New Guinea, New Georgia, Vella Lavella and the United States. Approximately 15 ethnic groups, including a Native American code talker, served in the unit. The oldest volunteer in 1943, who had about 20 years on the younger Marauders, was Joseph Doyer, a World War I veteran of the Canadian Black Watch Highlanders. One of the youngest was Bob Eatman, who enlisted in the Army at age 14, and was still too young to be served a celebratory drink after returning to the United States. Wilson was one of the Army's youngest lieutenants. At 16, he added two years to his age and walked seven miles through a nighttime thunderstorm to Farmville, Virginia, where he enlisted in the National Guard. The year before William Lloyd Osborne volunteered, he had escaped the Bataan Death March with another soldier. The two stole a rickety fishing boat and sailed 3,200 miles, while eluding the Japanese, from Luzon in the Phillippines to Darwin Australia. When they arrived in GEN Douglas MacArthur's office, he said, "Well I'll be dammed." There was at least one reluctant volunteer. Quentin Waite, 95, had no intention of volunteering after surviving some of the South Pacific's brutal battles. But a buddy he looked after, who was always getting into trouble, told Waite he was going to volunteer. Waite then volunteered. His buddy didn't. For the last several years, Waite has traveled from Michigan to support Ranger events at Fort Benning. He and Marauder James Richardson, 95, were at Fort Benning in July to see Marauder Bob Passanisi, 92, inducted into the Ranger Hall of Fame. Waite and Passanisi will join three more Marauders, Edward Brown, Marcos Barelas and Gilbert Howland, plus Mars Task Force member, Marvin Boyenga, all in their 90s, for the 70th annual Merrill's Marauder reunion Aug. 25 to 28 in Philadelphia. Attendance will be the smallest ever, caused in part by 16 Marauders making their final roll call during the last 12 months: John M. Jones, 101; Edson "Whitey" Keith Jr., 99; William S. Caprari, 99; Albert C. Robles, 97; Vincent Melillo, 97; Clarence Q. Branscomb, 97; Clinton Richard "C.R." Clough, 95; LaRue "Tom" E. Thompson, 95; Richard Murch, 94; Charles "Bob" Ketcham, 93; Gilbert Horn Sr., 92; Basil E. Pyle, 92; Henry F. Zaleski, 92; Dan Steve Whitlock, 92; Dan Gustav Hobahm, 92; and Irven Holliday, 90.